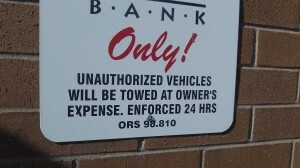 This sign cites the law on towing from private parking facilities. 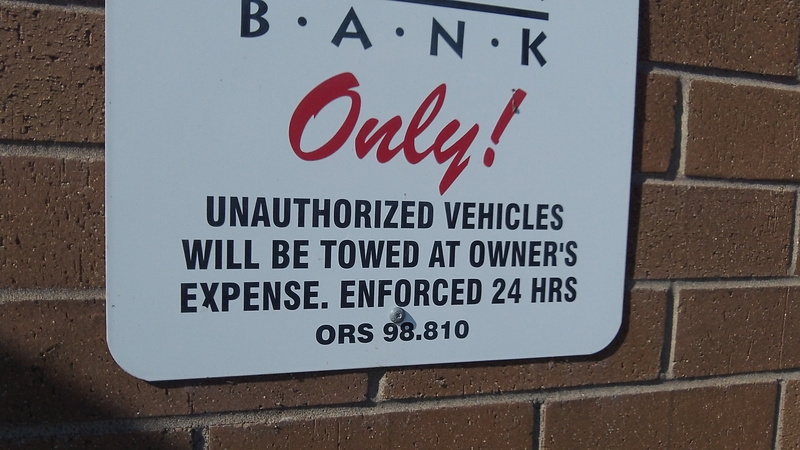 A new state law allows Oregon counties and cities to set maximum prices that tow companies can charge for giving back cars seized from private parking facilities. House Bill 3159 passed over Republican objections in the 2013 regular session of the legislature and takes effect on Jan. 1, 2014. It’s a response to predatory towing practices reported in the Portland metro area where, in the words of Linn County Commissioner John Lindsey, one tow operator was practically stealing cars.But this week the Linn commissioners shied away from getting into the business of regulating towing prices. Too many potential complications — that seemed to be the consensus among Lindsey and fellow Commissioners Roger Nyquist and Will Tucker. Councilman Rich Kellum told the county board that in the Albany City Council the towing issue had not come up. Maybe that’s because predatory towing from private parking lots has not been a problem in the mid-valley. It’s worth noting, though, that there are plenty of legal restrictions and requirements on hooking up vehicles and towing them away. People should be aware of those if they park where they shouldn’t and have the misfortune of having their cars towed.